Richard Bayliss and Wayne Womersley present - HONEY BEE. 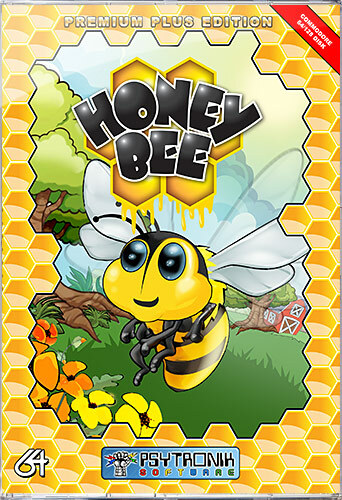 Take control of Buzzy, a busy but clumsy bee who has been given the job of collecting pollen from 16 levels. Avoid various perils on each level including natural hazards and rampaging wildlife and try your best to make the Queen Bee proud! Queen Bee is very annoyed at the fact that honey production is very low. Many of her worker bees are just too damn lazy. Luckily, there's one reliable busy, but clumsy bee available for the job, and that is you, Buzzy ... Queen Bee sends you out into the wild to bring back pollen so that bee farmers can produce more scrumptious honey for the villagers. In order to do this, as Buzzy, you must go to the flowers in each of the 16 screens and pick out pollen from one flower. You must then drop the pollen into the hive (from any height). One you have pollen in your possession you are unable to pick any more up until it has been dropped into the bee hive. If you drop pollen in the wrong place, or lose a life, you will have to restart the current level all over again. Avoid crashing into buildings, rocks, flower stems, flowing water (waterfalls are okay though), tree branches, the ground, lava, and of course, the natural wildlife. • 16 levelzz to explore!